Yes, I got me some bubble shorts, sailor shorts, no on the short shorts, yes on the Old Navy shorts and now... (*trumpet horns*) the Prefontaine shorts by Made With Moxie! Oh God, when I saw these babies pop up all over the internet, my eyes nearly popped out of their sockets. Having a good portion of my young existence in the eighties, I had my share of Dove shorts and to be able to bring it back is nothing short of RAD. I have a bit of polka dot fabric from Lecien both in green and blue (which I used some HERE) and I thought it would be perfect to use here. Lala's doin' a bit of stretching in honor of these shorts and look... look at that yummy little belly. *gah* I just wanna give her zerberts on her belly all day. I had left over fabric from the When We Were Young Series and some red piping. Aren't the buttons cute? The pattern is from Sweet Girls Clothes, pattern Z. A great book to have, btw. I can definitely see making some shorts in a wool blend for the fall/winter season. Cracks me up when she struggles to find her pockets. LOVE it! Gotta have pockets... where else can she put her half-eaten grapes and rocks? Two more going into the Shorts On The Line, Flickr group! Have you entered? It's not too late! super cute, Venus! Both versions are tres adorable, and the red piping adds just the perfect touch!! Piping makes everything look good! Thanks, Sanae! 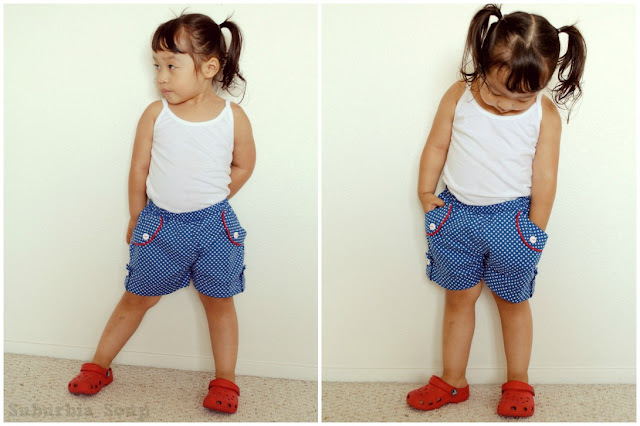 omg the pre shorts with the red crocks and lala belly= just amazing. i declare you the winner. Her belly drives me nuts! (I postpone to make harem pants too since OC doesn't want to wear my handmade "London Bus" pant) :(. The Prefontaines are the bomb! Thanks, Rachael. Thank you, An! The green ones are my favorite, too. I've yet to acquire a shorts pattern that is quick and cute, so the shorts making lately has been wanting. More chicken legs!